Here’s a crazy idea for a post. I’m going to tell you about a book that you probably don’t need. And I’m going to give you a link to a review that you can probably skip. I’ve been doing lots of reading about teaching writing in the last few months, as I work on my book. I very much appreciate the thinking in books by Jeffrey Wilhelm and Michael Smith. Recently I browsed a copy of their Fresh Takes On Teaching Literary Elements: How to Teach What Really Matters About Character, Setting, Point of View and Theme from the library. Rather than try to summarize the book myself, I’m going to let this handy-dandy helpful review do the work for me. Go ahead and read it, if you’re interested. Then again, maybe you don’t need to. Because this is a book for teachers. And it’s a fantastic book for teachers. But in reading it, I realized that homeschoolers and other parents don’t really need this book. We have it easy. We don’t need to devise lessons to learn about literary elements. We can explore them as they come up, as we lap up wonderful books with our kids. What’s that you say? You don’t know how to explore literary elements? You don’t, for that matter, even know what I mean by a literary element? (I’m not talking about fictional appearances by hydrogen and sulphur, surely.) And could I quit with all the teacher-y talk? Okey doke, let me tell you a story instead. When he paused for half a second, I asked where he got the term parallel characters. It’s not a phrase I remember using with him. I didn’t even realize that he knew how to use the word parallel correctly. 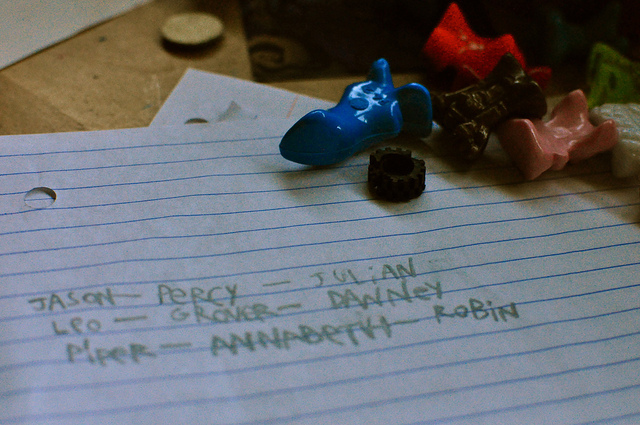 And he showed me a little chart he’d made–when he was supposed to be brushing his teeth–with characters from the Percy Jackson books, their sequel book, The Lost Hero, and Operation Redwood, our current read-aloud. The fact that he’d worked through this notion, and charted it, while I thought he was putting on his jammies left me feeling rather gobsmacked. But here’s the thing: if you talk about books with your kids as you read them, they’ll begin thinking more deeply about books. I’m not talking about formal lessons; I’m not suggesting you take a list of literary elements with terms like characterization and foreshadowing and begin pointing them out as you read. Your kid might want to stop reading with you altogether if you pull that sort of thing. You might even get a book thrown at your head. No, I’m just suggesting that you and your kids talk about what you like and dislike about books as you read them. The more you discuss, the more specific your conversations will become. Chatting about A Series of Unfortunate Events‘ Count Olaf may lead to a conversation about whether he’s a likable character or an unlikable one. You might find yourself talking about the point of a villain in a story, or even the irony of a villain who’s funny. Next thing you know, you’re driving to the park, listening to the third book in the series on audiobook, and your kid tells you to stop the disc because he wants to point out which words in a specific line make that villain funny. And you thought you were just driving to the park. And enjoying an audiobook. Nope! You’re helping your kid learn the elements of literature! It’s crucial, I think, that your statements or questions are authentic wonders on your part. Don’t say something unless it’s something you’re really pondering, or it will come across as You trying to play Teacher. Once you start posing such questions, your child is likely to do the same, and it’s your child’s observations that you really want to nurture. The fun happens when the two of you disagree with each other, or when the whole family disagrees, or when you and your kids disagree with what an author has written. Defending your perspective, you’ll delve into the writing. You’ll find yourself examining what the writer is doing–and the tools the writer pulls from his or her toolbox. Those tools are precisely the “literary elements” that educators refer to, those concepts featured in the subtitle of the Smith/Wilhelm book mentioned above: Character, setting, point of view, theme. And so on. It can be a challenge for teachers to create meaningful lessons that will impact kids in a classroom. This book does a good job of it. But think about it: when literature learning comes from conversations in the home, you can be pretty sure that transfer is occurring. The conversations stem from the kid’s own observations! It’s a more casual, child-led sort of learning, but it’s valuable learning. Real learning about literature and how it works. I think that we parents tend to discount this sort of learning. After so many years in school, we often have a (perhaps unconscious) belief that formal learning in classrooms, or from pre-determined curricula is somehow superior. But learning based on the child’s own curiosities and discoveries is rich and meaningful. And that sort of knowledge can accumulate into something bigger than you might expect. Years of enjoying books and talking about them can cultivate a deep understanding of literature and how it works. You don’t need canned activities and lessons to make that happen. In fact, canned activities and lessons can’t possibly reach your child like your own parent-child conversations can. This is one of the big ideas I’m planning to focus on in my book, and I’m hoping to write more about it. Please share your thoughts! If you feel a bit rusty on literary elements–or what goes on under the hood that makes literature satisfying–I have a book recommendation: Live Writing, by Ralph Fletcher. I’m sure there are plenty of good books out there on this topic, but I like this one because it’s insightful, it’s well-written, it’s cheap–and it’s written for kids. I’m recommending it for you because we all know that the easiest, breeziest way to learn anything is to read a children’s book on the subject! Plus, you might leave it lying in the path of an older child, and find him or her appreciating it as well. I hope you’ll pay attention to the conversations you and your kids have about books, and try to nurture them. 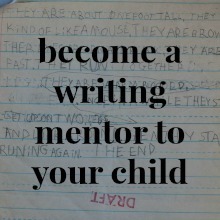 And if your kid neglects his responsibilities in favor of chatting literature, I apologize. But not really. Next up: another literature conversation, this one from one of my recent writer’s workshops. Wonderfully written post Tricia and I couldn’t agree with you more that years of exploring/discussing books together leads to a deep understanding. We’ve talked about this, but I’ll share my views here anyway. When a parent makes a list of all the books related to a particular theme or topic like Native Americans or water, over the years, the book list, and the field trips, and the parent-child discussions, and the movies related to that subject add up; and your child’s understanding of that topic is immense! You can’t purchase a curriculum as wonderful as that; and the best part about it is that your child was interested in it in the first place–you might have heard he/she mention something about water, for example, and you picked out some books because of their question. As a parent, you listened to what they were interested in and exposed them to more of it over time–and because they were interested, they enjoyed hearing more, and they retained what they learned. And what they’ve learned, they relate to new experiences in the world–but that’s another topic. Oh my. I’ve written too much. You got me going girl. You can never write too much for me! Immense is just the right word to describe how learning can accumulate over the years. I think that beginning homeschoolers don’t always have the perspective to see how all the little moments of engaged learning can really add up to something in the life of a kid. Sometimes we get hung up on curricula and “covering” everything, because we don’t recognize that although our kids are taking a more freeform, non-linear route, they’re actually building up a deep, meaningful education. You said it: you can’t purchase a curriculum as wonderful as that. Amen! Hooray for getting positively indignant over an author’s choices! Comparing those choices to books in which the author wrote more effectively is a great exercise–although none of you was thinking of it as an exercise, I’m sure. And surely conflict resolution and plotting are nowhere on the state standards for whatever grade your daughter would be in if she were in school, since she’s so young. But she gets it, doesn’t she? This weekend my middle daughter (age 13) read Stardust by Neil Gaiman. This lead to a conversation with her brother and myself about the elements of Neil Gaiman’s style and whether or not it would lend itself to a romantic novel. Then by coincidence, the movie (which we didn’t know existed) came on television. Naturally, there was much discussion comparing the book to the movie and which we preferred. I do love these specific, juicy examples! Your daughter’s casual conversation exhibits the kind of insightful thinking we want kids to have when they write essays. Conversations are great practice for that. And they’re even better as bonding experiences. Yes on that too! I need to get off this computer and go to bed but I just wanted to say what a great post that was. Earlier this evening I was talking to my daughter about similies as we stumbled upon a good one in our latest book in the “Little House” series. No packaged curriculum or great lesson plan can match authentic engagement. Beautiful! Now I want to go through the Little House books and hunt for similes! Thanks so much for saying hello, Jacinda. I popped over to your blog, and am so intrigued and concerned for your town after the earthquake. Sending good wishes your way. Thanks. Thoughtful and mindful of how learning takes place when nurtured and opportunities provided. We all make those connections on our own time frame. Thank you, Susie. And thanks for stopping by! This was the most interesting read for me in recent times! Patricia, your passion and thoughts on nurturing and creating love for literature among kids is admirable. These ideas are all the more valuable for us who study and read and talk English as a second language. Pari is only 5 now but she’s growing up with profound love for books and reading and writing. I hate shopping but LOVE book shopping and just browsing and I see how she too can browse books for hours together. When she picks up a book to take home, a discussion gets going then and there about why she likes that book – from the cover page to the back cover to the title! I have to tell you this – I will be the first one to buy the book you’re currently writing – about ‘writing’. 🙂 Will it be an e-book? I think that sometimes when parents have younger kids, they may not realize how much those little conversations about books can add up to deep and thorough knowledge about literature. Even if kids go to school, the conversations from home will be their primary literature education–if they’re lucky enough to experience them, as your Pari is. I so admire your writing eloquence in your second language! I’m hoping that the book I’m writing will eventually find its way to an agent and a publisher–but it’s probably a multi-year project. 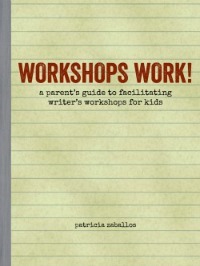 In the meanwhile, I’m hoping to release a shorter e-book on the topic of facilitating writer’s workshops in the home. Soon! I just happened upon a link to your site and this post from another blog and I LOVE IT! I have been experiencing this same thing myself in our homeschool journey. I keep thinking to myself, why is there so much worry about reading comprehension, it always seems like my kids ability to understand and process and compare literature happens so naturally that I don’t do those kind of formal lessons on it, yet anyways. Reading great books and sharing literary moments with my children is so wonderful! 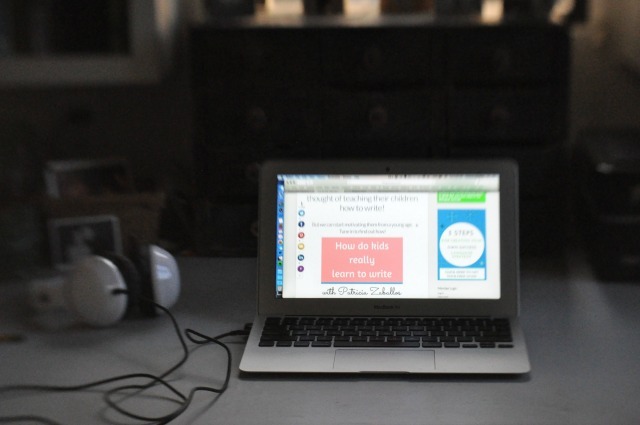 I look forward to looking around your blog, thanks for a great post! Lucky you, Sheila, for figuring this out while your kids are still young! I’m so glad that you found your way here. And what a wonderful farm business you and your family have! We lived in Portland for a short time, and my daughter was born there (a day and a half before we moved back to California!) A little bit of my heart will always be in Oregon. Reading this after linking from “Stop the Story” (1/18/13). It reminded me how reading together is a way to bridge the interests of what my kids love to do (Minecraft, YouTube subscriptions and memes, gaming) and what I do (read, knit, work, worry, fret, teach yoga–remember to chill out, cook, clean, fuss, fuss, fuss). You are like that wise friend who talks and makes me realize how much the stuff I worry about is being resolved in doing the things we like doing anyway: reading books together and talking a lot (much more than when they were in school). You’re such a good friend for someone I have never met. Aw, Jennifer. Your comment gave me goosebumps. Thank you. Your words make me realize that I *am* connecting to readers as I hope to connect. It makes writing here so worthwhile. Sending a big, virtual hug!